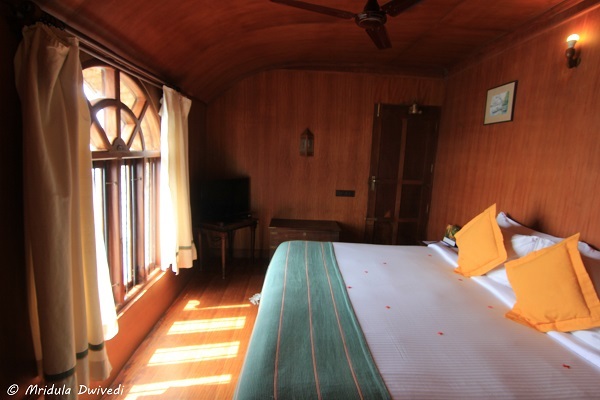 As I entered the one bedroom houseboat of Kumarakom Lake Resort, I knew the deck was going to be my favorite place. The bed room was air-conditioned, the dining area was air-conditioned but the deck was weather conditioned! 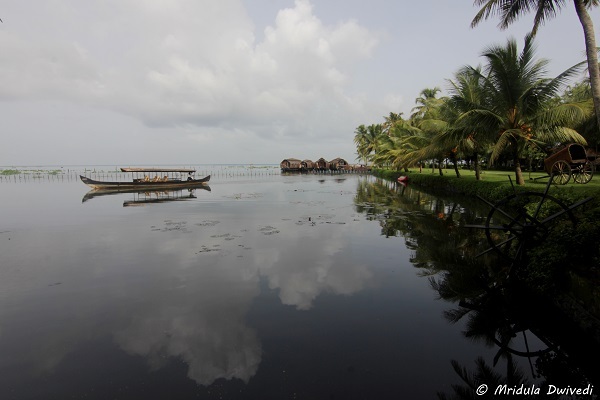 The Kumarakom Lake Resort Canoe and Houseboat! And as I said before, I had the whole houseboat to myself with a three member crew. Two of them would command the boat, taking turns. The third person was an equally important member, the chef! 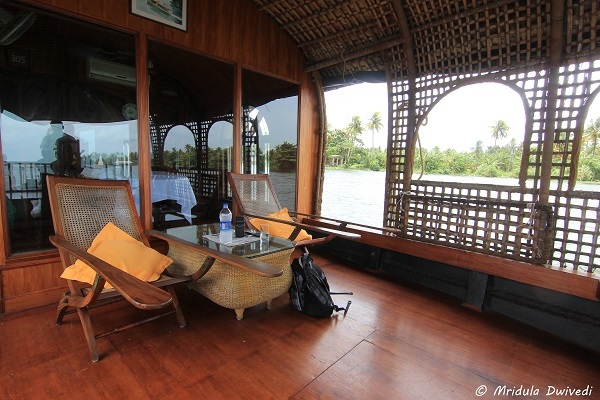 What I did is known as the houseboat lunch cruise at the Kumarakom Lake Resort. I had been on a canoe tour in the morning and I had reviewed my photos. I was determined not to make the same mistakes as I did in the morning. I also sort of knew what to expect. A canoe can enter in narrower lanes than a houseboat but the latter is built for comfort! A kayak can enter into even smaller waterways! I had a discussion with the head chef Deepak at the resort and we decided on a Kerala Lunch along with beer. A little after we pulled out of the resort the chef on the boat asked me if I would like to have my beer. I pleaded with him for tea and sure enough he had masala tea ready for me within no time! It was a good start to the tour. As we glided by the huge Venbanad Lake, we had many other houseboats for company. The weather was beautiful, sun was hiding safely somewhere behind the clouds. 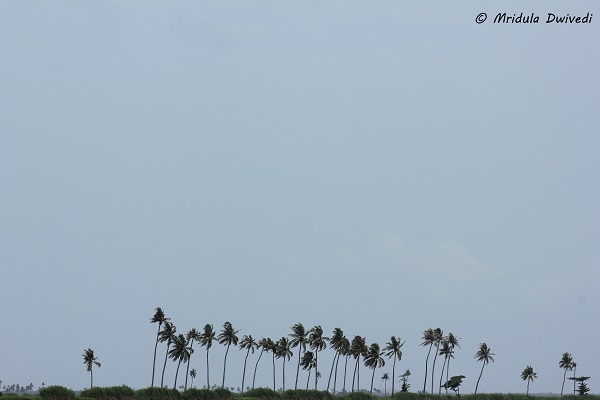 The coconut trees loomed far away in the horizon looking like stick figures. 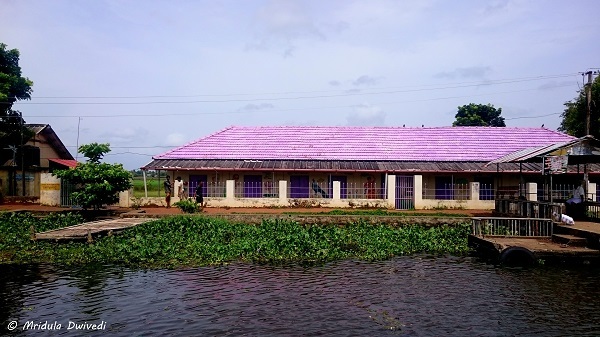 Traditionally the houseboats were known as Kettuvallam. They were huge and primarily used to transport rice from one part to another. It is said that they could carry the weight of three lorries! The traditional boats would have a room for the boatman and sometimes the family would also go on the journey. 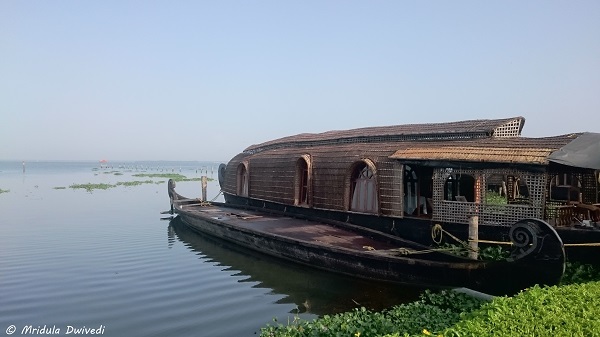 The ancient houseboats were wind powered and punted through the backwaters. The Other Side of a Houseboat! Now with roads connecting many parts, houseboats are more of a tourist attraction! They have also become a thing of luxury with air-conditioning and other comforts. After cruising for a while I realized that a single woman on a houseboat was a bit of a rarity, but to the credit of the people there were only a few cat calls. 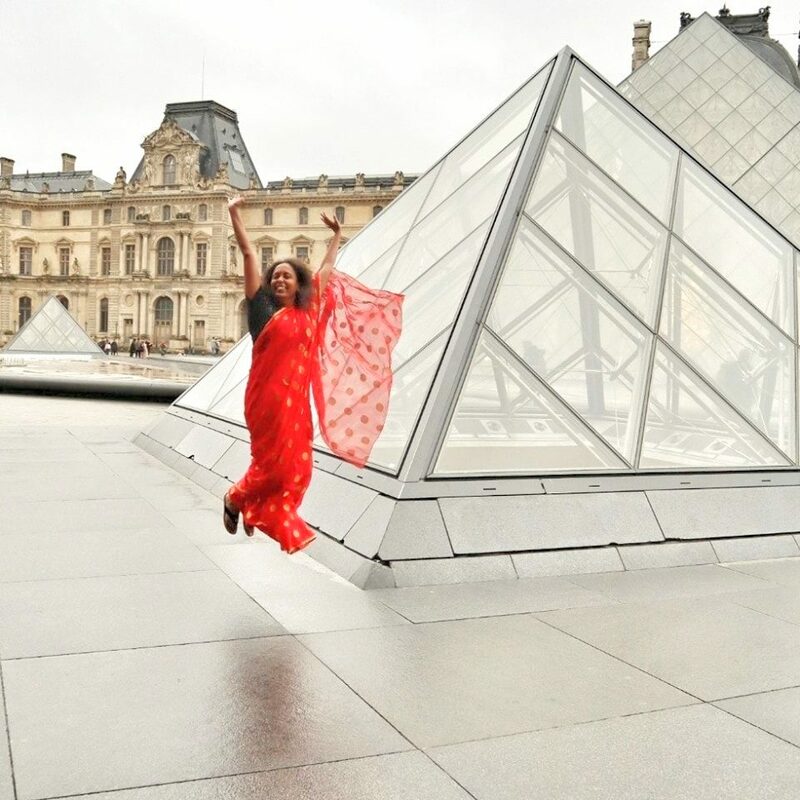 I think 80% of my time went in clicking pictures, 10 percent in having lunch and the rest in seeing things with my eyes! In a rare moment of self absorption I was about to miss out on a local church. It was immediately called to my attention by the person at the helm. And I want to kick myself not knowing the name of all the three crew members! And I had not even started drinking my pint of beer! 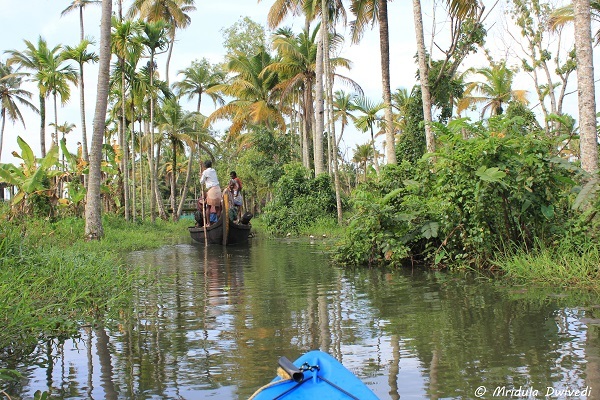 We would pass through lush green patches of coconut tress when we got closer to Alleppey. I was told that the houseboats need to be parked in the water by sundown as fishermen lay their nets at night. The houseboat movement would damage their nets! It is a local requirement. I saw a houseboat full of middle aged South Indian men having a merry time. They were dancing to some music, and to dance like that you have to be quite sloshed! And yet they were not bothered about anything else, they were having a jolly good time dancing on the boat! The cat calls came from sober people! Lunch was a lavish affair. It consisted of ullitheyal (a dry preparation of small onions) pineapple curry, avial, banana flower thoran, vendernna merunnupvrati (okra preparation) chilly sprouted beans, malabari veg curry, mushroom coconut fry (my favorite), Kerala rice, sambar, chips, poppadom, banana and adaprathaman! How do I remember all this? I asked the kind chef to write it down for me! He even prompted me to write out the English names of things that would no sense to me later like the small onions bit! They served it in the air-conditioned area with a pint of beer! I could not take a second helping of anything, the first serving itself was so huge! After lunch I was back to the deck. 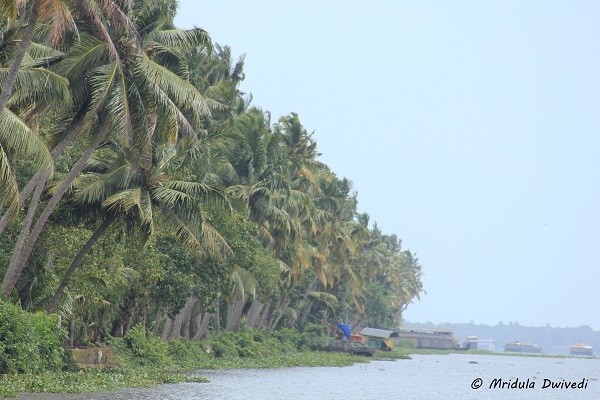 We were now passing by the Alleppey town. Like we park our cars near our homes, it was common to see a boat parked in these parts. I asked how much a boat would cost? 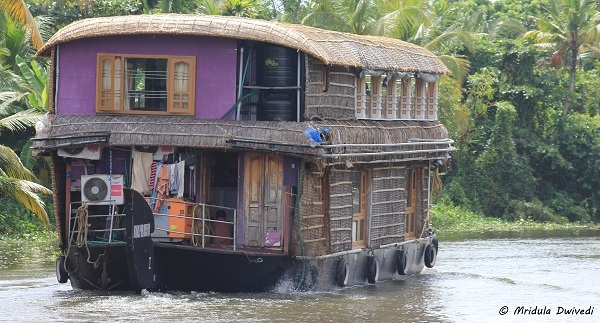 I was told that a simple boat would cost about 5 lakhs and a houseboat in which we were was priced at about 35 lakhs! I saw people waiting to take the local ferry to their destinations. Kids would be playing near their houses, which is the lake! Once we crossed the town we were back in open waters, on our way back to the resort. As we pulled back to the resort, I got out with a huge grin on my face. We spent 4 hours on the lake, from 12 noon to 4.00 pm. 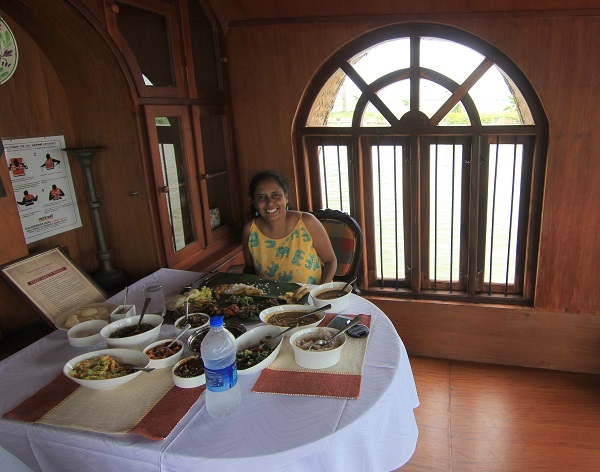 I am sure it would be very difficult for anyone to match the luxury of my first houseboat lunch cruise offered by Kumarakom Lake Resort! PS. 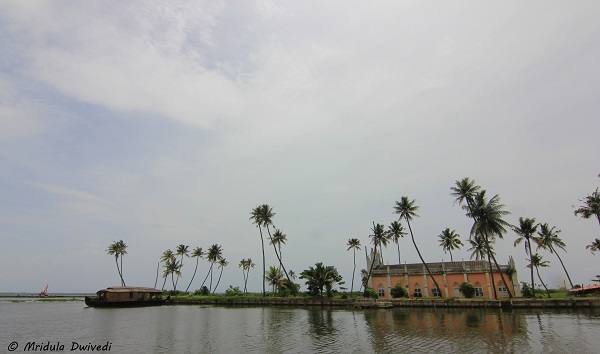 I was invited by Kumarakom Lake Resort on this trip.